I know. I can't believe it either but I am profiling something made by Cinnabon on this relatively healthy eating site. But just hear me out. 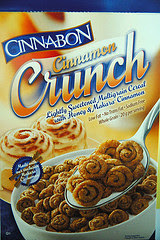 Cinnbon's Cinnamon Crunch cereal tastes awesome and is good for you, too! These tasty little cinnamon-roll shaped nuggets are lightly sweet, smell wonderful and are chock full of good ingredients: whole oat flour, whole brown rice flour, turbinado brown sugar, fruit juice concentrate, wheat flour, wheat starch, cinnamon, honey and canola oil. Pretty good for the company that brought artery-clogging sweet treats to malls and airports across America. Other reviews online gave this cereal lower marks for having "weird" ingredients or for not being "sweet enough." Give me a break! I know that you, dear readers, won't agree. Give them a try! I love autumn! And I love autumn cooking. This past weekend I went to my favorite local apple orchard and loaded up on apples and cider. Their fragrance filled the car on the way home and made me dream of all the wonderful ways to put these amazing fruits to use. There are alot of complicated apple recipes, but there are many simple ones, too. And those simple ones taste absolutely divine. For instance, if you can peel an apple, you can make applesauce. 1. 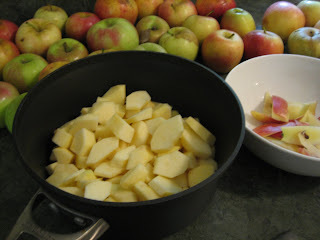 Peel, core and dice a bunch of apples -- just fill your favorie stock pot nearly to the top. 2. Add a tablespoon or two of water or cider (don't go overboard here -- a tablespoon or two really does the trick). Add a dash or two of cinnamon, a few drops of vanilla extract, and a pinch of sea salt. Stir and cover. 3. Bring the whole mixture to a bubble over medium high heat. Reduce heat to low, remove lid and let simmer until apples break down and are very soft (the length of time it takes for this to happen depends on the kind of apple you are using). Stir often. 5. If you like chunky sauce, you're done. If you like smooth sauce, puree in a blender or food processor until smooth. Eat some while it's still warm (this is a wonderful treat) and store the remainder in the refrigerator.